"I come from Des Moines. Someone had to." I was first introduced to Bill Bryson in his memoir The Life and Times of the Thunderbolt Kid. This quote from the book captures Bryson's voice and verve which I find to be completely endearing. Who doesn't love a guy who so unabashedly finds humor in the world...and himself as well? 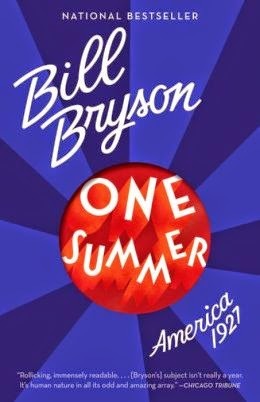 While I'm not a baby boomer, Bill Bryson spun his tale and drew me into his story in such a way I wondered if I hadn't been born in the wrong generation. Clearly, I related to him. Since then, I've read A Walk in the Woods which made me both inspired to take nature hikes (someday) and giggle at the gung-ho trekkers in the sporting good stores. I've also read At Home which spooned me a plethora of domestic history. I now know things like how salt and pepper caused horrific wars. And that Thomas Jefferson wasn't only a founding father of our country, but he was a founding father of french fries. And that our ancestors used to make bathing an annual rite. (Italian bath houses initiated certain behaviors which provoked the movement to equate dirtiness to holiness.) But enough about those books. The purpose of this blog is to rave about One Summer. Not just any summer–the summer of 1927 in America. Beyond his clever wit, Bill Bryson is a brilliant historian. I appreciate his punchy journalistic style as he conveys fascinating facts, layering gobs of information while painting the landscape of the era. Is it possible to become nostalgic about a time period in which you never lived? Sure. I had heard of many of the people/issues written in the book, but I didn't really get it. I knew Charles Lindbergh flew across the Atlantic. But I had no idea he was THE HERO OF THE DAY. Not the mention the impetus to modern American aviation. And a Nazi...for a while anyway. There were so many more colorful characters in this book, I could hardly contain myself. My spouse really has no need to read this book. I pretty much read it aloud to him. How could I not? Babe Ruth. Jack Dempsey. Henry Ford. Clara Bow. Al Capone. Herbert Hoover. Yes, Herbert Hoover. Maybe I should say Warren Harding instead. He could be described as...colorful. Perhaps unscrupulous is a better word. (I should let Cal Coolidge slide off this list, but I won't. After all, it was Dorothy Parker who said after Silent Cal's death, "How do they know?") All kidding aside, even Cal Coolidge played a pretty interesting role in this book. I became infatuated with some of the obsessions of the time. Babe Ruth and Lou Gehrig were hitting more homeruns, as individuals, than other teams. I can't help but think Babe Ruth was our first true celebrity athlete. He was the first to negotiate a contract–when contracts weren't quite so ridiculous. Announcers actually made more than the best athletes–including Babe Ruth. The Roaring 20's conjures images of fun. Excess. Great things were happening–like talking movies. But horrible and unsettling events were happening as well. The largest school killing in our nation's history. A raging Mississippi flood which devastated enormous areas of land. Highly publicized executions with racial themes and anarchy accusations. As a book lover, I looked forward to Bryson's take on the modern writers: Hemmingway, Stein, Fitzgergald, so on. So, when Mr. Bryson informed me how the most popular writers of the day were the bad and trite ones, I was a bit shocked. The best authors didn't become until years later. Was this a reflection of the mood of the time? A particular, shallow, sentiment? Methinks Fitzgerld was saying something like that in Gatsby. As a banker, I was also intrigued by an action that was taken by the newly formed Federal Reserve. Without going into great detail, the Fed had cut interest rates to spur investments in Europe. (Europe was still recovering from the war and economic woes–trying to repay war debts.) The grave miscalculation led to more borrowing the US. This behavior, combined with an over-valued stock market added to our woes after the Crash. There's so much more to ravish through in this book. Knowing the 1929 Crash is about to erupt makes all of these events that more fascinating. Without realizing it, I was comparing our current situation to this particular past. And while many parts made me feel proud, I certainly did my share of head scratching. I do wonder, what can we learn from it? An era of excess. An overvalued stock market. Racial tension. Uneasy foreign policy. Obviously, there are no easy answers. But because of Mr. Bryson's incredible talent, he's presented a piece of the United States' story which give us pause for reflection and more discourse. Much more discourse.